Executing our stock and call option trades is fast and efficient. But what actually goes on behind the scenes after we enter market or limit orders? 1- We place our trade order with our online discount broker. 2- The broker then utilizes an electronic routing system to send the order to a market maker like Citi, UBS and others. 3- The market maker pays our discount broker a fee for this market flow, about $0.01 or $0.10 for the 100 shares. Dark Pools like Liquidnet- A dark pool (or dark pool of liquidity) is a private electronic transaction network, typically maintained by major banks and securities companies, where stocks are bought and sold by clients of those companies. Because the matching of buyer and seller is done entirely within the control of the bank, the bid, offer and sale prices are not published to exchanges (such as the NYSE). Dark pool operators have the ability to route orders either to an exchange or to their own private network, depending on availability, pricing and client preference. Ironically, before computers took over the floor of the NYSE, there was a popular saying relating to dark pools: The NYSE was the biggest and most efficient dark pool the markets have ever seen or will see, i.e. when you gave your order to a broker it was essentially dark because he wouldn’t just go into the crowd and announce “a million shares of BCI at the market” because the market would move on him…he kept a portion of the order details (i.e. size) in his back pocket and “worked” the order to get the best price or execution. Real people on floor, not computers, are still significant players for executing large blocks and especially for setting the opening prices…the majority of NYSE order flow comes at open and close because the prices are most accurate. *Remain short the stock and look to buy it back at a lower price. This is where they make their money. Let’s say the Designated Market Maker (DMM) sells us a stock short @ $30.10 and buys it a few seconds later for $30.09 for a profit of $.01 per share or $1.00 for 100 shares. 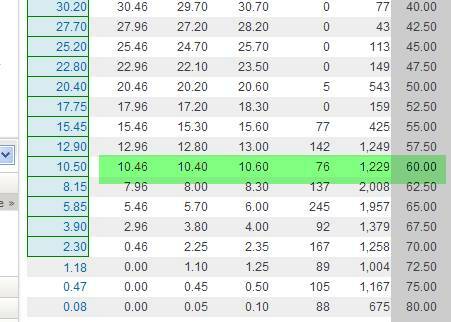 Since the DMM paid our online discount broker $0.10 for market flow and garnered $1 in profit, that’s a $0.90 profit for the transaction. It may seem like a mere bag of shells on first blush but do this millions of times per day and it becomes an extremely lucrative occupation. Dark pools and brokers will argue that the increase in market liquidity and the positive impact of competition are benefits for all those who participate in market activities. Contrary to the way things transpired in the past, the SEC appears to be on top of these rapidly-changing market platforms. For the week, the S&P 500 rose by 2% for a year-to-date return of 9.5% including dividends. I am looking forward to the long-term ‘party” we will all have if and when Eurozone concerns and housing issues continue to improve and the jobs numbers turn positive. It could happen! BCI: Cautiously bullish selling predominantly in-the-money strikes. I’m, reading (and re-reading) chapter 4 of your latest book on technical analysis. One thing confuses me. How can the MACD be negative and the histogram positive? One is sending a negative signal, the other positive? Thanks for any help to clear this up. 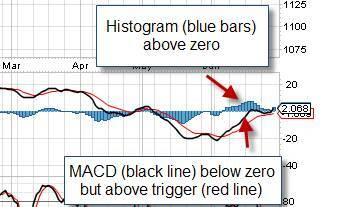 As shown in the chart below, a negative MACD means that the 26-day EMA is above the 12-d EMA and therefore below zero (black line). However, you will note that this line is above the trigger (9-d EMA which is its moving average) and therefore displaying positive momentum. Since the MACD histogram gives us a quicker signal than the MACD itself, I place more emphasis on it. MACD histogram should be evaluated along with other technical signals before making an investment determination. The Weekly Report for 06-29-12 has been uploaded to the Premium Member website and is available for download. With three weeks left until expiration what are your goals if you entered a position Monday for the July options? Can you give an example from this weeks list that meets that goal (I know its not a recommendation). With 3 weeks remaining in a contract cycle, I do lower my monthly goal from 2-4%. For ITM and OTM strikes, I look to generate 1-2%, preferably closer to 2%. For ATM strikes I look for 2-3%. I randomly selected two stocks from this week’s watch list and placed them in the calculator for ITM strikes to show that these results are achievable. Click on the image to enlarge and use the back arrow to return to this blog. – You can use Safari to access the BCI website. – Then sign into the Member’s Area. – Download the current report. – There are a number of free PDF reading apps in the iTunes Store. – Check out the free Adobe PDF Reader app. – You can use Safari to access the BCI website..
– Download the “Basic Ellman Calculator”. 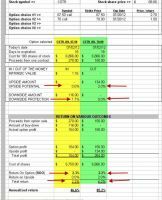 the formatting of Excel (.xls or.xlsx) spreadsheets. 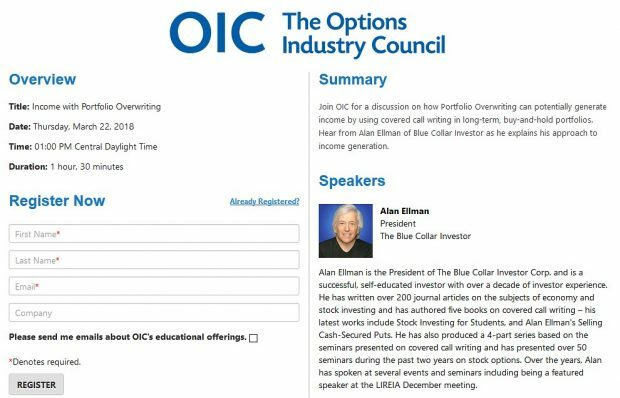 So, net/net, you can use all of the features that are available in The Blue Collar Investor system. You may have try a few different spreadsheet apps until you find one that you like. The same comments apply to the newer Android based tablets as well. If your eyes are better than mine, the above tools should work with the iPhone and Android smart Phones. I download the Weekly Report to my iPhone and always have the current copy with me. I checked out “QuickOffice Pro HD” this morning on my iPad and it work perfectly with the Ellman Camculator. So, those of you who want to use your iPad or Android Tablet with the BCI system…you’re good to go! One of our new premium members suggested CSTR as a stock on our current list that returns a good 3-week return for the in-the-money strike. 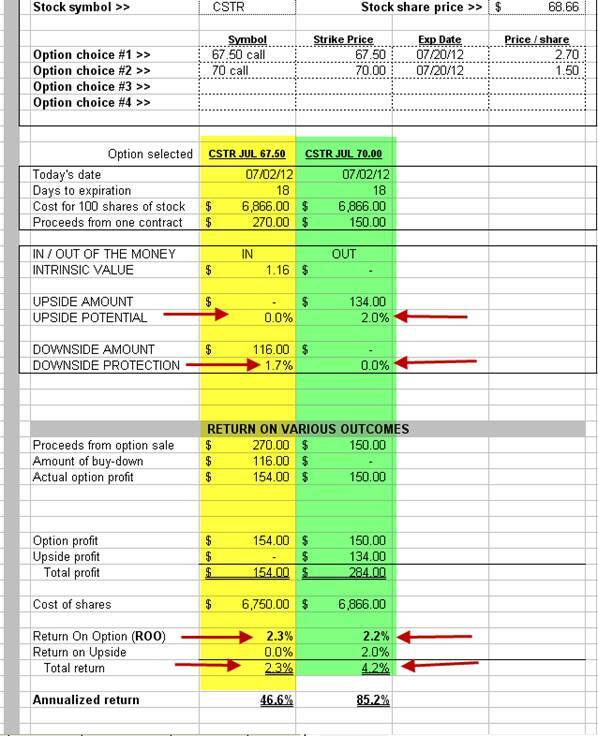 Below is a screenshot of the calculations for both the in-the-money and out-of-the-money strikes. The red arrows highlight initial option return (ROO), downside protection of ROO (ITM) and upside potentialo (OTM). Click on image to enlarge and use the back arrow to return to this blog. On June 18th I bought 200 shares of sxci for 98.69 and sold the july 100s for 3.20. Today the stock is at 103.55. Is there any exit strategy I should consider at this time? thank you. At this point your trade has reached its maximum profit of 4.6% for the month as long as the price remains above $100. We look for the time value to approach zero to close prior to expiration Friday. At this point the $100 call still has significant time value so I take no action in cases like this. If the price continues higher that may change as the deeper in the money the strike, the lower the time value. Type in ticker in upper right and hit “quote”. I’m still trying to get a handle on this Mid Contract Strategy. I bought CSTR back in May for $61.59 and sold the JUN 60 Call for @2.90. On expiration Friday I rolled out to the July 60 Call for $4.50. Today I’m looking at CSTR hovering around $70 share. Even though this stock has run up recently, the chart and fundamentals still look good so I’m holding back from just unwinding and looking for another stock. I’m plugging the numbers into the “what now” tab. But, it looks like I would be better off waiting until expiration Friday to roll out again and maybe roll out and up. I’m assuming we mainly look for a mid contract unwind to free up cash. I know this may not be the case with everyone, but if we have cash sitting in our account it doesn’t seem like you need to look for a mid contract unwind. First let me congratulate you on a series of outstanding trades. If you unwind now, your profit will be > 9% for the 6-week time frame. Now the key to using the mid-contract unwind exit strategy has to do with the value of the TIME component of the premium. The deeper in-the-money the strike moves, the lower the time value. In this case the strike is $10 in-the-money. Viewing the options chain below, we see the “ask” of the $60 call is $10.60. I’d try to negotiate that down to $10.55 but let’s say we pay $10.60. The intrinsic value is $10.46, leaving only $0.14 of time value, $0.05 less if we are sucessful negotiators. That represents about one fifth of 1% of our 9% profit. Since the profit in the CSTR “deal” cannot increase, we can close that position and use the cash in another position (see pages 264-271 of “Encyclopedia…”). This isn’t a matter of “needing” more cash but rather increasing the “velocity” of our money. If you decide to do nothing until expiration, you will have a 9%, 2-month profit with huge protection at this time. That route is okay also as long as you are making an informed decision. Click on image to enlarge and use the back arrow to return to this blog. Happy holiday to one and all! This week’s 6-page report of top-performing ETFs and analysis of ALL Select Sector Components has been uploaded to your premium site. We have also uploaded the 3rd quarter High Dividend Yield Stocks with LEAPS report located in that same area. In one of your videos you talk of negotiating a higher bid price. Can you explain? Is it in your new book which I just ordered? When the bid-ask spread is $0.15 or more, there are opportunities to “negotiate” a higher bid-sell price than the one published. This has to do with the “Exchange Act Rule 11QAc 1-4” also called the “Show or fill Rule”. I place a limit order slightly below the mid-point of the spread and will oftentimes generate a higher premium. For details of this strategy see pages 223-227 of “Encyclopedia for Covered Call Writing”.